THE SPIRITED POWER OF Embolden E+ ENTICES YOU TO SAY YES AT EVERY TURN, TACKLING NEW TERRAIN WHILE HAVING A BLAST, AND RIDING FURTHER AND FASTER THAN BEFORE. Embolden E+ isn’t just your bike, it’s a gateway to a new level of play, utilizing a powerful SyncDrive Pro motor, RideControl ONE’s clean controls, and a confidence-inspiring Liv 3F frame design atop a 130 mm fork and 120 mm rear suspension. Ample standover height and a fully-integrated 500Whr battery let you maneuver through technical sections with ease. Tubeless-compatible Boost 27.5-inch wheels with plus size compatibility, combined with an efficient single-pivot linkage design, means quick and capable descending without batting an eye at climbs. Internal cable routing makes for a clean riding machine, and fender and kickstand compatibility make Embolden E+ the perfect choice for any route. A SyncDrive Sport Motor, new fully integrated 500Whr battery, handlebar-mounted RideControl ONE with available App, and PedalPlus technology mean going further, faster, and more efficiently than before. The 130/120 platform creates a playful and adjustable ride, and plus size compatible Boost 27.5x2.6" wheels create all-around capability. A lively blend of trail bike and pedal- assist, Embolden E+ is designed to smoothly tackle those trails you have been yearning to get to in that spare time you don’t have. Take Embolden E+ with that group of fast friends, or take her out confidently after an unfortunate hiatus from mountain biking. Because Embolden E+ is so eager to charge the trails, you’ll have the energy and time to conquer new goals on and off the bike. Relish in the freedom to join the quicker group ride, zip up the climbs and take a confidence- inspiring stance on the descents. 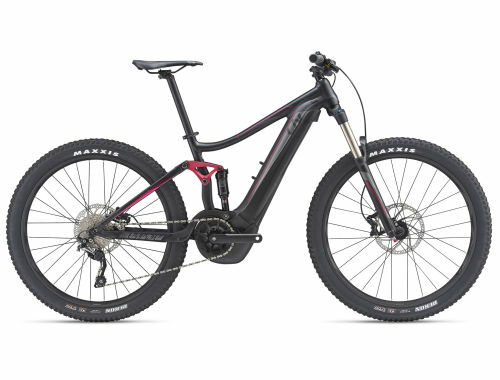 A lively blend of trail bike and pedal- assist, Embolden E+ is designed to smoothly tackle those trails you have been yearning to get to in that spare time you don’t have. Take Embolden E+ with that group of fast friends, or take her out confidently after an unfortunate hiatus from mountain biking. Because Embolden E+ is so eager to charge the trails, you’ll have the energy and time to conquer new goals on and off the bike. Relish in the freedom to join the quicker group ride, zip up the climbs and take a confidence-inspiring stance on the descents. With five support modes and tunable support ratios up to 350%, the SyncDrive Sport motor empowers riders to push their limits and pursue new experiences. With up to 80Nm of torque, the SyncDrive Sport can deliver high power even at low speeds, responds instantly (500 milliseconds) when power is applied to the pedals. The result is a quiet, natural and powerful riding experience that fuses with a rider’s instincts. Giant and Liv’s PedalPlus 4-sensor technology system measures exact pedal force and seamlessly delivers the appropriate power boost for pedal assistance that feels natural and smooth on all types of terrain. Using speed and torque sensors, along with motor and pedal rotation sensors, PedalPlus 4-sensor technology produces even power across the entire gear range. Embolden E+ comes with a 500wh battery, ready to take you farther, faster. Now available in a sleek downtube integration with a new and improved design. The new EnergyPak is firmly attached, well designed, and smoothly integrated into the bottom of the downtube to create a streamlined look and a compact profile that closely matches the design of modern mountain bikes. The side-release battery is easy to remove for super-quick charging. Liv's E-bike control panel that helps you change support modes at a press of a button. Now updated with navigation, heart rate monitoring and a clock. With this new system, Liv E-bikes can automatically adjust pedal support to maintain your desired heart rate, whether you are interval training or avoiding over-excursion. The RideControl EVO features wireless connectivity, allowing not only firmware updates, but also viewing of incoming messages, phone calls, and emails on screen. 120mm of plush rear suspension is possible with FlexPoint, Liv's single pivot suspension platform. A 130mm fork creates a playful, confidence-inspiring ride. Boost hub spacing and wider 27.5 x 2.6-inch for improved traction and control.